Piqua’s Mick Karn puts up a shot as Tippecanoe’s Grifffin Caldwell defends Friday night at Garbry Gymnasium. Piqua’s Garret Schrubb shoots over Tippecanoe’s Ben Knostman Friday night. Piqua’s Kameron Darner flies to the hoop Friday night against Tippecanoe at Garbry Gymnasium. 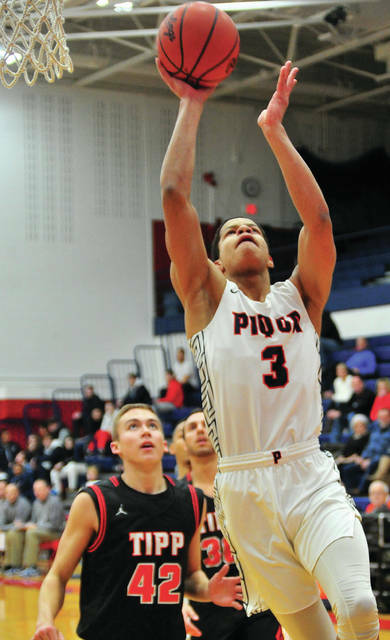 Piqua’s Trey Richmond scores two points against Tippecanoe Friday night. Tippecanoe’s Griffin Caldwell, puts up a one-hander against Piqua Friday night. 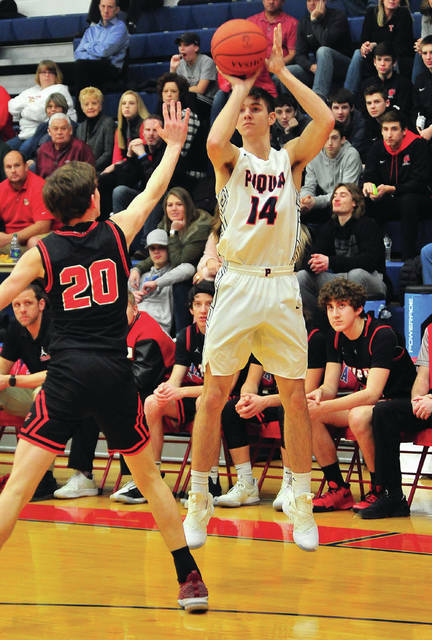 The Piqua boys basketball team got off to a fast start and held on for a 64-53 win over Tippecanoe to split the season series with visiting Tippecanoe in GWOC American action Friday night at Garbry Gymnasium. Piqua improved to 6-11 overall and 3-9 in GWOC American play and will host Tecumseh Saturday in non-conference action. Tippecanoe drops to 5-11 overall and 3-8 in GWOC American play and will travel to Bellbrook Saturday. 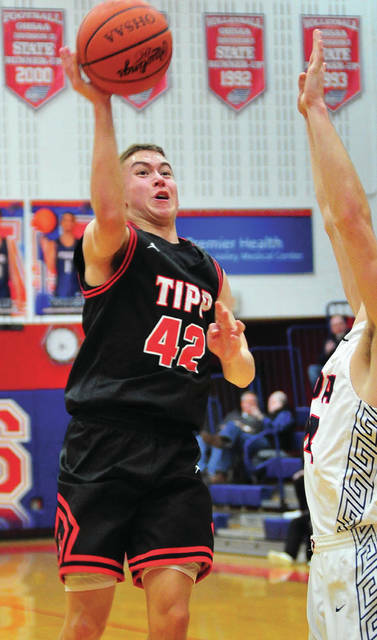 After Tippecanoe’s Zach Frederick opened the game with a three, Garrett Schrubb answered for Piqua and Trey Richmond scored off a Mick Karn assist. Nolan Mader had a basket for Tipp to tie the game 5-5, but Piqua outscored the Red Devils 12-4 the rest of the quarter to take a 17-9 lead. Richmond scored off another Karn assist and Karn hit a three, before a Ben Knostman basket for Tipp made it 10-7. Qurri Tucker hit a three, Richmond scored inside and both Richmond and Schrubb hit one of two free throws to make it 17-7 before Mader had the final two points of the quarter. 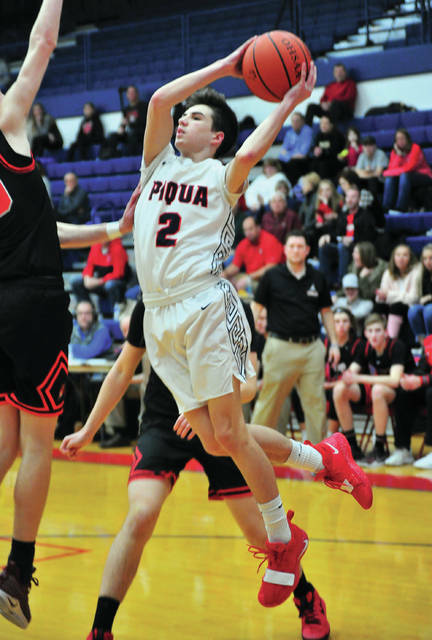 Piqua opened a 22-11 lead early in the second quarter after another Tucker three, but Tippecanoe outscored the Indians 12-2 over the final six minutes of the half to get within 24-23. Mader scored six straight points, then Frederick had a three to make it 22-20. After a basket by Piqua’s Zach Tillman, Frederick hit another three to close the deficit to 24-23 at the half. A Mader three midway through the third quarter had Tipp within 30-28, but Piqua finished the quarter on a 13-2 run. Schrubb started it wit ha three and Tucker hit two free throws. Karn followed with another 3-pointer, before Mader broke the run with two free throws for Tipp to make it 38-30. Tillman answered with a 3-point play and Karn scored to make it 43-30 going to the fourth quarter. Riley Hill and Tucker scored to start the fourth quarter to make it 47-30 and Piqua led by double digits most of the fourth quarter. Piqua was still up 57-44 when Nick Robbins hit a three to make it 57-47. After and Indians free throws, Robbins scored against to get Tipp within 58-49. Mader hit one of two free throws to make it 58-50 with 51.2 seconds to go, but that was as close as the Red Devils could get. 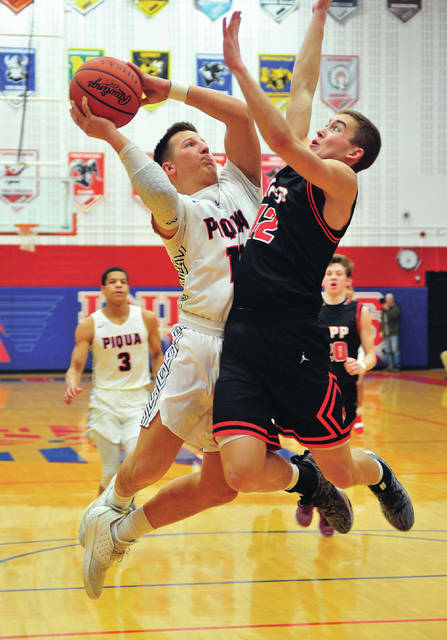 Richmond had another double-double for Piqua with 22 points and 10 rebounds. Tucker scored 14 points, Karn netted 12 and Schrubb added nine. Mader led Tippecanoe with 19 points, while Frederick added 13. Robbins scored eight points and Griffin Caldwell added seven points. Piqua was 22 of 42 from the floor for 52 percent and 14 of 17 from the line for 82 percent. Tippecanoe was 18 of 40 from the floor for 45 percent and 10 of 11 from the line for 91 percent. Tipp won the battle of the boards 19-16, but had 16 turnovers to Piqua’s eight. Nolan Mader 6-6-19, Ben Knostman 1-0-2, Zach Frederick 4-2-13, Pat Manes 0-0-0, Griffin Caldwell 3-0-7, Nick Robbins 3-0-8, Jake Rowland 1-2-4, Peter Guevara 0-0-0. Totals: 18-10-53. Qurri Tucker 4-4-14, Kameron Darner 0-0-0, Trey Richmond 8-6-22, Mick Karn 4-2-12, Garrett Schrubb 3-1-9, Zach Tillman 2-1-5, Iverson Ventura 0-0-0, Riley Hill 1-0-2. Totals: 22-14-64. 3-point field goals —- Tippecanoe: Mader, Frederick (3), Caldwell, Robbins (2). Piqua: Tucker (2), Karn (2), Schrubb (2). Records: Tippecanoe 5-11 (3-8), Piqua 6-11 (3-9). Reserve score: Piqua 41, Tippecanoe 36.